Orion is the first album by the Swedish duo Ursus X, comprising Bjorn Johansson and Staffan Luckander, and takes us into a rather beguiling instrumental journey with two ‘side long’ slabs of music, full of intricate musicianship and melody. 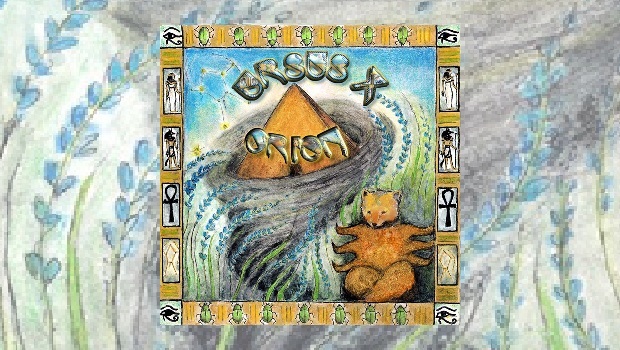 The naïve cover painting by Nanna Rosen portrays Egyptian hieroglyphics, symbols and a Pyramid… alongside a rather strange bear (presumably the ‘Ursus X’ of the band name.) Such visual imagery indicates some of the themes explored musically, but this is also an album which invites us to use our own imaginations. Needless to say, virtually all instrumental rock albums fall under the shadow of the once innovative and truly inspirational (and phenomenally successful) Tubular Bells by Mike Oldfield. Some artists choose to use this now classic template as a direct ‘homage’, such as Robert Reed in his Sanctuary albums. Reed unashamedly composes and plays very much in the classic Oldfield style, and does so very effectively, easily surpassing Oldfield’s more recent and much weaker material. Ursus X are moulded in the same format and style, with some very ‘Oldfield guitars’ at times, but they do broaden the musical palette into areas beyond that musical world. Orion Part One opens atmospherically with percussion, chants and choral intonations, and it feels like we are entering a mystical world. The music is suffused with Eastern sounds and rhythms overlaid with some fine rock, particularly a short but flowing guitar solo by Johansson. The hypnotic rhythms continue to underpin this piece as synthesisers, mandolins and guitars weave folk tinged melodies. The distinctive tones of a Greek Bouzouki and the mellow Sitar guitar transport us further into evocative and exotic landscapes, supported by pulsing synths, melding old and new into a captivating musical melange. Themes come and go and later return in almost half remembered echoes to enhance a dream-like feel to the music. Oldfield’s inevitable influence is brought to the fore as Orion Part One closes with a solo which would not have been out of place on one of his classic era albums. One curiosity about this album is that the bass is an essential foundation to much of the music, and yet is not credited in the sleeve notes, although a vast array of other instruments are identified… including ‘computer geeking’ and ‘steel beverage bottles’! The Eastern rhythms and zithers return to gently open the second part of the album before Reka Joo’s enchanting and swooping flute solo takes flight in a classical passage. This segues effortlessly into an interweaving and rather frantic guitar and synth duel, which exemplifies the interesting musical diversity and skill which runs like a rich vein right throughout this album. Not all the passages work quite so fluently or imaginatively (particularly some mercifully but painful short synth horns on Part Two), but on the whole this is an excellently produced album with compositions that largely hold the attention over extended passages (by no means an easy achievement). The musicianship displays great skill and conveys an emotional touch, particularly on the closing section. It goes without saying that fans of Mike Oldfield (and Robert Reed?!) will probably find this very much to their taste. As a debut it is very promising, and it will be interesting to see how the duo develops in the future, and whether they can continue to draw on their own original musical ideas and seek further inspiration from world music and folk influences whilst resisting the temptation to emulate others. In all honesty, it is when Ursus X are NOT being like the man with an apparent insatiable obsession with Bells of the Tubular variety and they display more confidently their own musical personality that they are more interesting and original.